The Seven of Cups Tarot card is a call for caution. It depicts a man surprised by a multitude of options. Before his eyes, he finds 7 cups floating in gray clouds, each containing great treasures and dangers. But, beware! It is impossible to determine which is which at first sight. This card relates to the querent’s ambitions, dreams, and aspirations. It usually appears when we are in the presence of dreamers who may be having problems realizing their dreams. This card appears to show all the possible paths and options we have before us. However, that is where the problem lies. Confusion, doubt, excessive planning, or the lack of concrete plans can ruin the best companies, relationships, and projects. When the Seven of Cups Tarot card appears reversed, it is necessary to protect yourself from living out of illusions. The excessive use of your imagination can lead to a big disappointment. Upright: Creativity, imagination, fantasy, visions, new options, overwhelming feelings, prosperity, confusion, dreams, ambitions, speculation, decision, temptation, determination, desires, projects. Reversed: Illusiveness, instability, disappointment, failed decisions, risks, lack of character, evasion, escapism, losing touch with reality, lack of maturity. 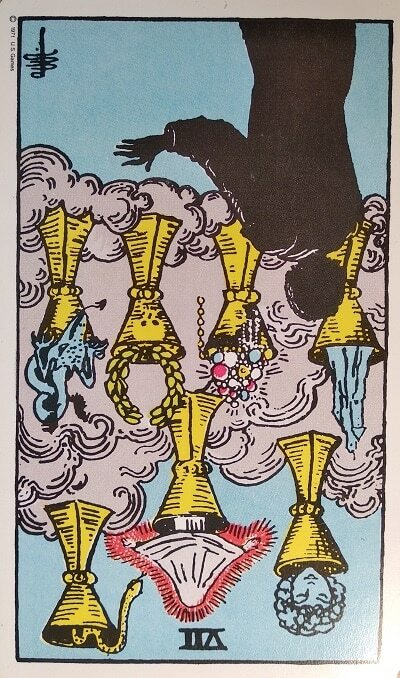 In the Seven of Cups Tarot card, Pamela Colman Smith creates one of the most enigmatic and meaningful images we can find in the Rider-Waite Minor Arcana. In this card, we find an individual with his back towards us. We can contemplate his expression of astonishment at a vision that captivates him, however. In the midst of gray clouds, 7 floating cups tempt him with treasures, pleasures, and powers. Desire… that is the keyword for the Seven of Cups Tarot Card. 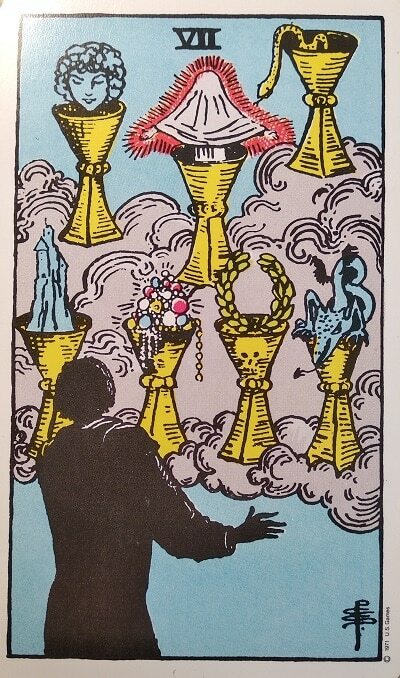 Each floating cup shows the central character a possibility, a fulfillment of his wishes: love, power, knowledge, and success. All of the Seven Deadly Sins are represented in this majestically drawn card. In some of the cups, we can find danger as well. Even Satan shows himself in his serpent shape offering all his knowledge and charm. Between traditionally positive images such as the cup full of jewels and pearls, there’s a dangerous dragon waiting to attack. This man must weigh between wisdom and the knowledge represented by Original Sin. The head of a woman is an offer of companionship and love followed by the tensions of excessive lust and passion. The covered figure represents an illusion that could also be a trickster. The power of a castle represents victory and honor but also loneliness. Finally, there is a dragon, who is a mythical creature whose supernatural force can be used for good or for evil. Gray clouds evoke reverie, ephemerality, and deception. Everything can disappear in the blink of an eye. The Suit of Cups is related to feelings, emotions and the element of Water. Maybe that is why we will find ourselves constantly reviewing the meaning and message of The Moon Tarot card. When we saw the meaning of this Major arcana card, we find that at night, terrors awaken, objects change shape and shadows mislead us creating terrifying illusions that can deceive our senses. There is a popular saying in reference to clueless people, who lack grasp with reality and are very fanciful, that says: it’s as if you lived on the Moon. How does it feel to live on the moon? We would have to ask Neil Armstrong … or we can ask the central character of the Seven of Cups Tarot card. This person is so mesmerized by all the options, talents, and awards he can get that he hasn’t taken any action or even been able to decide on what to do next. Sometimes in life, we are faced with a dilemma. Which is right and wrong? The concept of good and bad is blurred in the presence of multiple variables from which we have to choose. The pressure to decide and move forward can be overwhelming with this card, but taking your time to weigh all the risks will always be the wisest path. It is not about taking a passive attitude towards things, though. It is imperative to assess the issues, study the options, and go for the best possible one. The Seven of Cups Tarot card teaches us about temptations, paralyzing fears, and ambition. These combined factors can take the most talented person and leave them trapped in a permanent state of anxiety, but they can also be the necessary push to move forward. What gifts are you willing to accept in your life? Do you let ambition control your decisions? Are you prudent when evaluating your projects? Remember, even rocket science has gone through a tortuous path to control and reduce risks. When the Seven of Cups appears upright in a tarot spread it indicates that the querant is a dreamer. Focused on thoughts, projects, and adventures, this querent or situation may need to come down to earth. The excessive options and talents of this person may be confusing and diverting him or her from his path to success. In general, the meaning of this card means that we are at a crossroads full of multiple options, which will be illuminated by the other cards that make up the spread. 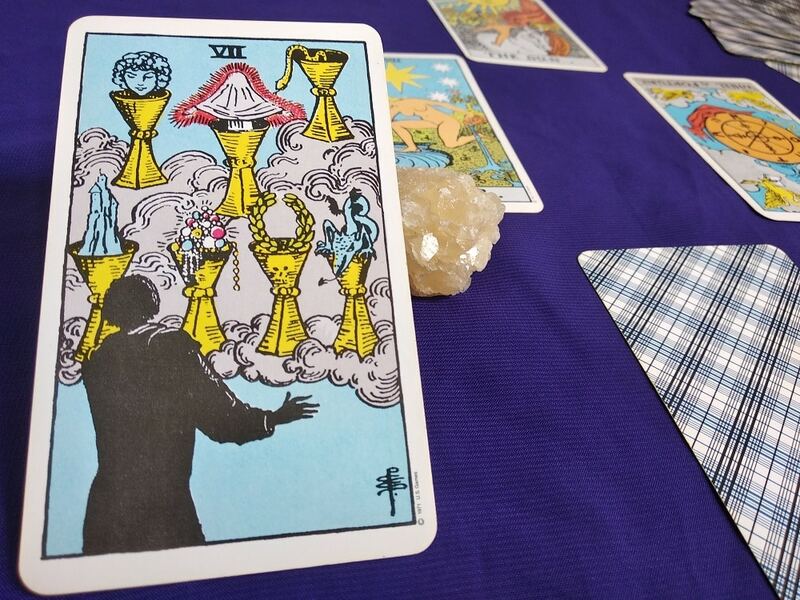 Therefore, with the Seven of Cups Tarot card, it is time to take responsibility and decide the best way to follow our dreams and the risks we are willing to take. Yes, risks. There will always be risks. One of them is to lose ourselves in our imagination, in the world of fantasy and temptation. Associated with the world of addictions and excessive ambition, this card prompts us to be alert. It is important to keep our imagination under control and our feet on the ground. Building castles in the air can be fun, but in the end, they will disappear with the first breeze. If you have been carried away by fantasy and find yourself caught in the Moon’s energy, this card warns you that it is time to come back to Planet Earth. 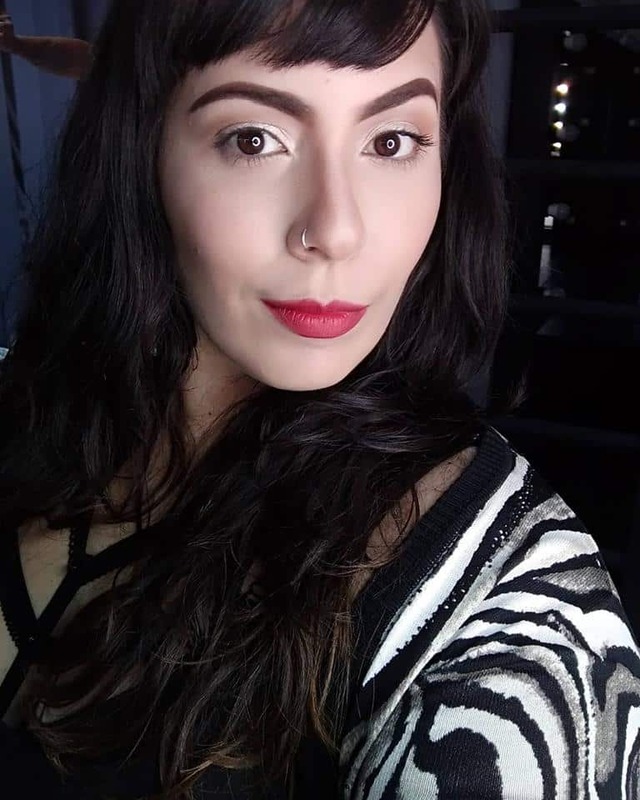 The positive characteristics of people associated with the Seven of Cups Tarot card are a connection with their emotions, creativity, and versatility. Although they seek beauty, they must learn to endure the tougher aspects of reality. When the card appears upright, it is a call to action and to carefully consider each of the multiple options that appear before you. Usually, the Seven of Cups Tarot card appears upright in a Tarot spread related to love when we meet a person whose appeal is over the roof, and we have many options to contemplate. When dealing with an impossible love, it might be the querent’s lucky day. For singles, love will come knocking at your door. The symptoms you feel might be only in your head or being caused by the way you process things. Calming your thoughts, learning to meditate, or consulting a therapist can help you improve your health tremendously. Finally, you will receive the reward for all the effort you have put in your work in these last months. You will enjoy the recognition of your co-workers, and you can climb the corporate ladder if you keep putting in the effort. Fortune will knock on your door in the form of multiple investment options. You will enjoy good luck in all the projects you undertake…just try to take care with respect to who you are associating with. A reversed Seven of Cups Tarot card tells us that you are being too much of a dreamer and need to focus more on making your projects come true. On the other hand, it can also indicate that all doubts have dissipated and one option looks much more attractive than the others. This card can also refer to a person who does not feel comfortable with any aspect of his life. The reason for this is that his dissatisfaction is not due to the external aspects of his concrete reality, but to internal aspects which he must learn to manage in a more reflective way. Meditate and connect with your inner self, and you will be able to overcome any self-absorption that hasn’t allowed you to progress. 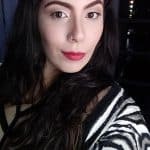 You start to see relationships in a more realistic way, and you have a better understanding of your needs and what you have to contribute to your partner. Having managed to control your escapist behaviors, you no longer need to pursue shallow flings. You are becoming ready for the commitment you have craved for years. Going for exams and medical checkups will help you determine if your symptoms are as serious as you think. With that information, you will be able to understand which habits to change to improve your health. The success you’ve expected will come, but it will take longer than you planned. You will have a much clearer picture and become able to assertively visualize your professional calling. It is important to maintain caution in your investments, but it is possible that multiple options will be consolidated into a single endeavor, and thus, they will become more profitable. The Seven of Cups Tarot Card is a call for caution. 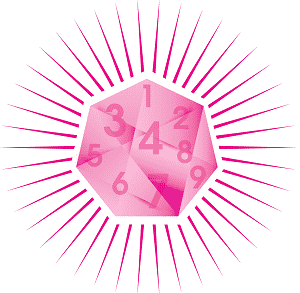 This Minor Arcane is for people having problems conquering their dreams. Learn its full meanings here.